Did you know that the x-ray generator is the most expensive component of an x-ray system? 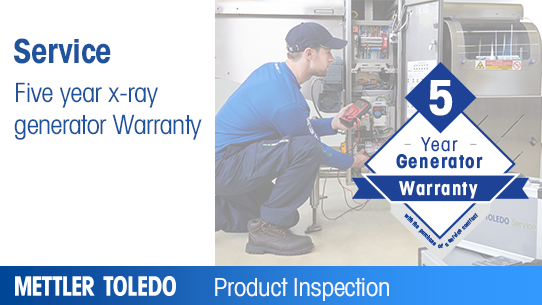 METTLER TOLEDO Safeline X-ray generators previously came with 30 months' warranty, however, we are so confident in the reliability of our generators that we are extending this to five years for our X-Series systems. Should a mechanical or electrical fault occur with the generator of one of our X-Series models within this timescale, the warranty will cover repair costs and/or replacement parts and labour. This market leading generator warranty is available with the purchase of one of our X-Series models after March 1st 2017 in conjunction with either a Standard Care or Comprehensive Care Service Package*. X-ray inspection systems have become indispensable in providing food safety and quality assurance worldwide. However, regular periodic maintenance is vital to ensure continuous productivity and accurate and consistent results. A METTLER TOLEDO Service Care Package will help to maximise productivity over the lifetime of x-ray equipment and your return on investment by providing support whenever and wherever you need it. X-ray systems are frequently installed at Critical Control Points (CCPs) and if they fail manufacturers run the risk of significant unplanned downtime, resulting in reduced output and lost revenue. Increase output and profitability by enhancing uptime and Overall Equipment Effectiveness (OEE). Minimise long-term impacts on the x-ray inspection system by identifying defects that could potentially cause a sudden breakdown in the future. Avoid unexpected and costly downtime and repairs by ensuring the equipment continues to operate at peak performance. Maximise equipment lifetime and return on investment by avoiding the impact of wear and tear. Aid compliance with regulatory demands. We offer three distinct Care Packages designed to meet customers' individual needs – Basic Care, Standard Care and Comprehensive Care. Depending on equipment usage and environment, we'll also assist in determining the optimal type and frequency of maintenance service, as well as the level of repair coverage required. Preventative maintenance - inspection and cleaning of all mechanical components, Inspection and testing of electronic components, andInspection for wear and damage. Standard Care also safeguards against unexpected repair labour costs and includes access to a technical hotline, providing fast and efficient help for operational and set-up problems. In addition, Comprehensive Care allows customers to have full budget control by including repair labour coverage in case of equipment breakdown and replacement parts coverage.